El presente artículo tiene como objetivo presentar de forma resumida los diferentes factores que están involucrados en la diferenciación y el mantenimiento del fenotipo óseo, en contraste con los factores adipogénicos, cuya expresión determina procesos de diferenciación mutuamente excluyentes. Por otro lado, se propone el posible uso terapéutico para distintas patologías óseas como la osteoporosis. Los datos fueron obtenidos de estudios clínicos aleatorizados y de revisión, en idioma español e inglés, de los últimos 15 años, que incluyeran los términos Mesh: Osteoporosis; Osteoporoses; Osteoporosis, Post-Traumatic; Osteoporosis, Senile; Osteoporosis, Age-Related; Bone Loss, Age-Related; Factors, Transcription; Transcription Factor; Adipogeneses; Bone Formation; Osteoclastogenesis; Endochondral Ossification; Endochondral Ossifications; Ossification, Endochondral; Ossification, Physiological; Ossification, Physiologic. Médico especialista en medicina interna. Fellow Endocrinología 2º año. Fundación Universitaria de Ciencias de la Salud. 1. urtis EM, Moon RJ, Dennison EM, Harvey NC, Cooper C. Recent advances in the pathogenesis and treatment of osteoporosis. Clin Med. 2016;16(4):360– 364. 2. Paula FJADE, Black DM, Rosen CJ. CAPÍTULO 29 Osteoporosis y biología ósea. 13th Editi. Williams. Tratado de endocrinología. Elsevier España, S.L.U. ; 2017. 1323-1364 p.
3. Armas LAG, Recker RR. Pathophysiology of Osteoporosis. New Mechanistic Insights. 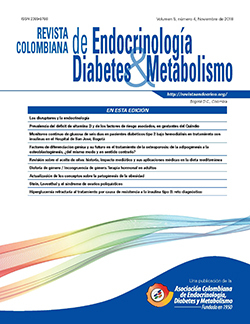 Endocrinol Metab Clin North Am. 2012;41(3):475–86. 4. Rosen CJ, Ackert-Bicknell C, Rodriguez JP, Pino AM. Marrow fat and the bone microenvironment: developmental, functional, and pathological implications. Crit Rev Eukaryot Gene Expr. 2009;19(2):109–24. 5. Feng X, McDonald JM. Disorders of Bone Remodeling. Annu Rev Pathol Mech Dis. 2011;6(1):121–45. 6. Eriksen EF. Cellular mechanisms of bone remodeling. Rev Endocr Metab Disord. 2010;11(December):219–27. 7. Zayzafoon M, Gathings WE, McDonald JM. Modeled microgravity inhibits osteogenic differentiation of human mesenchymal stem cells and increases adipogénesis. Endocrinology. 2004;145(5):2421–32. 8. Rubin MR. Skeletal fragility in diabetes. Ann N Y Acad Sci. 2017;1402(1):18– 30. 9. Güler-Yüksel M, Hoes JN, Bultink IEM, Lems WF. Glucocorticoids, Inflammation and Bone. Calcif Tissue Int. 2018;7. 10. Beederman M, Lamplot JD, Nan G, Wang J, Liu X, Yin L, et al. HHS Public Access. 2016;6:32–52. 11. Chamberlain G, Fox J, Ashton B, Middleton J. Concise Review: Mesenchymal Stem Cells: Their Phenotype, Differentiation Capacity, Immunological Features, and Potential for Homing. Stem Cells. 2007;25(11):2739–49. 12. Berendsen AD, Olsen BR. Osteoblast-adipocyte lineage plasticity in tissue development, maintenance and pathology. Cell Mol Life Sci. 2014;71(3):493–7. 13. Kawai M. Adipose tissue and bone: Role of PPAR?? in adipogénesis and osteogenesis. Horm Mol Biol Clin Investig. 2013;15(3):105–13. 14. Kawai M, Rosen CJ. PPAR?? : A circadian transcription factor in adipogénesis and osteogenesis. Vol. 6, Nature Reviews Endocrinology. 2010. p. 629–36. 15. Yu WH, Li FG, Chen XY, Li JT, Wu YH, Huang LH, et al. PPARγ suppression inhibits adipogénesis but does not promote osteogenesis of human mesenchymal stem cells. Int J Biochem Cell Biol. 2012;44(2):377–84. 16. Kang Q, Song W-X, Luo Q, Tang N, Luo J, Luo X, et al. A Comprehensive Analysis of the Dual Roles of BMPs in Regulating Adipogenic and Osteogenic Differentiation of Mesenchymal Progenitor Cells. Stem Cells Dev. 2009;18(4):545–58. 17. Lerner UH, Ohlsson C. The WNT system: Background and its role in bone. J Intern Med. 2015;277(6):630–49. 18. Felber K, Elks PM, Lecca M, Roehl HH. Expression of osterix is regulated by FGF and Wnt/β-catenin signalling during osteoblast differentiation. PLoS One. 2015;10(12):1–17. 19. Kähkönen TE, Ivaska KK, Jian M, Büki KG, Väänänen HK, Härkönen PL. Role of fibroblast growth factor receptors (FGFR) and FGFR like-1 (FGFRL1) in mesenchymal stromal cell differentiation to osteoblasts and adipocytes. Mol Cell Endocrinol. 2017;1. 20. Du X, Xie Y, Xian CJ, Chen L. Role of FGFs/FGFRs in skeletal development and bone regeneration. J Cell Physiol. 2012;227(12):3731–43. 21. Miraoui H, Oudina K, Petite H, Tanimoto Y, Moriyama K, Marie PJ. Fibroblast growth factor receptor 2 promotes osteogenic differentiation in mesenchymal cells via ERK1/2 and protein kinase C signaling. J Biol Chem. 2009;284(8):4897–904. 22. Chadwick AC, Jensen DR, Hanson PJ, Lange PT, Proudfoot SC, Peterson FC, et al. NMR Structure of the C-Terminal Transmembrane Domain of the HDL Receptor, SR-BI, and a Functionally Relevant Leucine Zipper Motif. Structure. 2017;25(3):446–57. 23. Kim J, Ko J. A novel PPARγ2 modulator sLZIP controls the balance between adipogénesis and osteogenesis during mesenchymal stem cell differentiation. Cell Death Differ. 2014;21(10):1642–55. 24. Pan G, Cao J, Yang N, Ding K, Fan C, Xiong WC, et al. Role of glucocorticoid-induced leucine zipper (GILZ) in bone acquisition. J Biol Chem. 2014;289(28):19373–82. 26. Zeng ZL, Lin X long, Tan LL, Liu YM, Qu K, Wang Z. MicroRNAs: Important Regulators of Induced Pluripotent Stem Cell Generation and Differentiation. Stem Cell Rev Reports. 2017;0(0):1–11. 27. Guan X, Gao Y, Zhou J, Wang J, Zheng F, Guo F, et al. MiR-223 regulates adipogenic and osteogenic differentiation of mesenchymal stem cells through a C/EBPs/miR-223/FGFR2 regulatory feedback loop. Stem Cells. 2015;33(5):1589–600. 29. Phetfong J, Sanvoranart T, Nartprayut K, Nimsanor N, Seenprachawong K, Prachayasittikul V, et al. Osteoporosis: the current status of mesenchymal stem cell-based therapy. Cell Mol Biol Lett. 2016;21(1):12. 30. Pino AM, Rosen CJ, Pablo Rodríguez J. In Osteoporosis, differentiation of mesenchymal stem cells (MSCs) improves bone marrow adipogénesis. Biol Res. 2012;45(3):279–87. 31. Rocha MA de C, Silva LMC, Oliveira WA de, Bezerra D de O, Silva GC da, Silva L dos S, et al. Allogeneic mesenchymal stem cells and xenogenic platelet rich plasma, associated or not, in the repair of bone failures in rabbits with secondary osteoporosis. Acta Cir Bras. 2017;32(9):767–80. 32. Burdette AJ, Guda T, Thompson ME, Banas R, Sheppard F. A Novel Secretome Biotherapeutic Influences Regeneration in Critical Size Bone Defects. J Craniofac Surg. 2017;0(0):1.